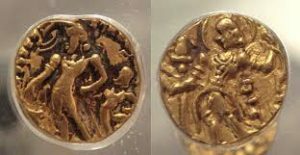 Mauryan Empire Coins: “A sophisticated civil service governed everything from municipal hygiene to international trade. The expansion and defense of the empire were made possible by what appears to have been the largest standing army of its time”. Mauryan Empire, one of the most powerful and greatest empires in India was founded in 311 BC by the great emperor Chandragupta Maurya. Pataliputra as its capital, the empire lasted from 321 to 185 BC. Ranging from Chandragupta Maurya to Ashoka the great, this period in Indian history is known for contributing to the country, the greatest rulers of all times. Before looking into the coinage system of Mauryan Empire, we need to understand the economic system of the empire. The economy of a country plays an important role in determining its progress. Arthasastra is a source on both the political and economic nature of the Mauryan Empire. The nature of the country during Chandragupta Maurya is described by Megasthenes in the following words, “The Indians all live frugally, especially when in camp. They dislike a great undisciplined multitude, and consequently, they observe good order. Theft is of very rare occurrence. They live, nevertheless, happily enough, being simple in their manners and frugal. They never drink wine except at sacrifices. Their beverage is liquor composed of rice instead of barley, and their food is principally a rice-pottage”. The major changes that took place in the economic sphere during the Mauryan rule were increasing the use of coins, improvement in trade and commerce, improvement in communication and transportation and so on. 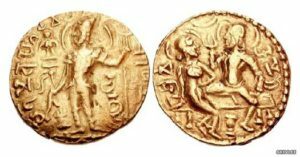 Mauryan coins were similar to the punch mark silver coins of Early Kingdoms. But Mauryan coins generally had five punches and also a sun symbol in those punches. The coins issued by the Mauryans are mostly silver and a few copper pieces of metal in various shapes, sizes and weights. They also have one or more symbols punched on them. The symbols included the elephant, the tree in the railing symbol and the mountain. Some were geometrical symbols. Arthasastra says that the metal was first melted in crucibles (musha) and purified with alkalis or `Kshara` as part of the manufacturing of coins. These purified metals were then beaten into sheets on an anvil with a hammer, cut into pieces with clippers and finally were stamped with dies or punches with symbols. Coins had either the Royal insignia or the symbol of the local guild that struck the coin. 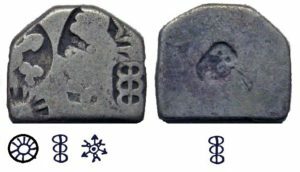 Mauryan punch mark coins are broadly divided into two categories; the first period and the second period attributed to the Janapadas or small local states and the Imperial Mauryan period respectively. A great number of Mauryan punch mark coins have been found, the period of which can be traced from 300 – 100 BC. Coins have been also identified as cut from full coins for the purpose of half denominations. It is said that at the end of the Mauryan period, the country was affected by rising inflation.